Lil Majin recently placed 3rd in Evo’s Tekken 7 tournament. Although not within the TWT, this Evo was the largest Tekken tournament in history, and Majin’s placement was a first for America in the face of their Asian competitors. Fighting game fans know that Korea is a veritable superpower when it comes to Tekken. Throughout the franchise’s lifespan, the country — and Asia as a whole — has dominated competitive Tekken tournaments, with a majority of the game’s top players hailing from South Korea and Japan. 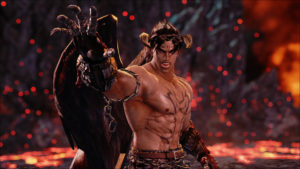 In fact, the top seven players in the Tekken World Tour standings are Korean: Western players begin to filter in beneath the seventh place line, with Tissuemon representing Italy at eighth place and Anakin sitting at 14th place. Since Tekken 7’s release in the West, several Western competitors have managed to take top placements in both Master and Challenger-ranked events in the Tour — but none have managed to take the Evolution Championship Series. Terrelle “Lil Majin” Jackson is one of Tekken’s notable Western fighters. Standing beside the likes of Joey Fury and Speedkicks, Lil Majin currently sits at third place in America’s rankings within the Tour. Having taken fourth place at CEO and seventh at Final Round earlier this year, Majin’s strength was visibly growing — and Evo would provide him with yet another outlet to test his mettle. True to form, Majin’s King was a force to be reckoned with. 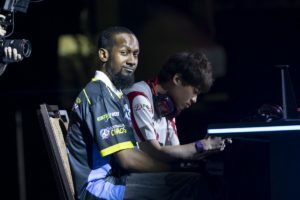 He made it through pools on Winners’ side, set up to play CEO champion JeonDDing in the Semi-Finals: Majin had previously lost to JeonDDing at CEO, rendering their ensuing match as a critical runback. Majin’s practice paid off – he took it over JeonDDing in a close 2-1, bringing the match to the final round of the last game. Majin went on to defeat Noroma in a strong 2-1. With this victory under his belt, Majin was set up for Top 8 as America’s sole representative. 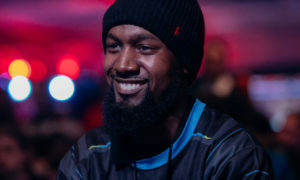 While this wasn’t the first time an American had made Top 8 for the game, it did mark a first for the title’s official console release: Speedkicks placed seventh in 2016 before the game was available to Western players. JDCR currently sits at fourth place in the TWT standings, and for good reason: as the 2017 Evo champion with multiple top placements in his crown, JDCR and his Dragunov were a major threat to the competition. This didn’t deter Majin one bit: his previous experience fighting Dragunov online made him confident in their upcoming battle. I forgot to say important things. EVO2018 had a great game. All the Korean players were strong this year as well (legendary players). Thai players were also in the final (very impressive). 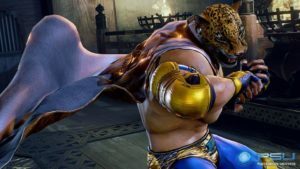 It was Tekken 7’s top character against a leopard skinned wrestler. The crowd went wild for the American favourite, and the energy was palpable – every win and loss had an audible effect on those gathered in the arena. In what has been called “match of the year,” Lil Majin took the Winners’ Semi-Final over JDCR in a convincing 2-1 run, giving audiences hope that America could finally take a Tekken Evo. LowHigh was next on the lineup, having taken out the TWT champion Qudans to sit in the Winners’ Final. Using Shaheen, LowHigh took it over Majin 3-1 with Shaheen, moving on to Grand Finals and knocking Majin into the Losers’ Final. Majin faced Qudans in the Losers’ Final, where his Devil Jin wrought major destruction; Qudans beat out Majin 3 – nil, knocking him out of the tournament at third place. While Majin didn’t emerge an Evo champion, he did make a major statement in regards to America’s strength in the game. Majin was the first American to place that high in the title — and in the largest Tekken tournament in history, at that. When they ask me what I do and who I do it for?! For the love of #TEKKEN! I finished 3rd place out of 1547 Tekken 7 competitors from around the globe! I've never taken so many pictures with fans and signed so many autographs in my life lol. Majin’s success stands behind that of other competitors at Evo 2018. With Sonic Fox’s success against his rival GO1 and Problem X’s win over Tokido, the West made a great show of strength against its Asian adversaries in multiple titles. While third place wasn’t a total victory, it stands as a massive testament to America’s Tekken prowess, and fans can expect even more from Lil Majin in the future.